Figure 1: Superficial anatomy of glands and ducts of the canine eye. Source: McCracken T.O., Kainer R.A. and Carlson D. (2008) Color atlas of small animal anatomy: the essentials, : Blackwell Publishings. Figure 2. 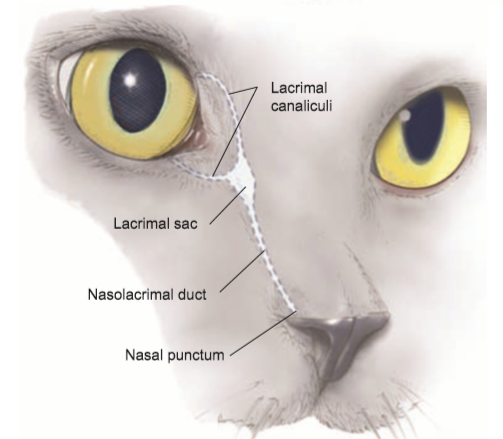 Superficial anatomy of glands and ducts of the feline eye. 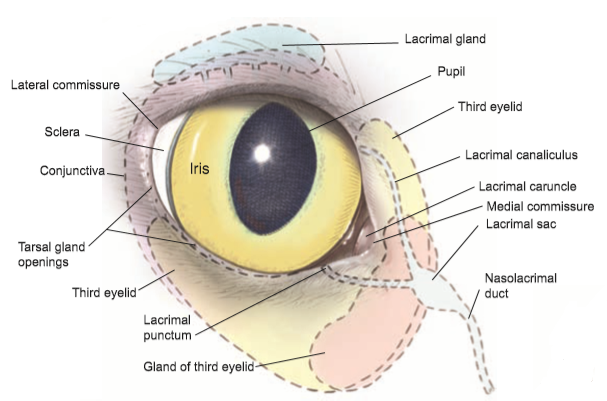 Lacrimal gland and third eyelid gland are mixed mucoserous tubuloacinar glands which are responsible for production of the aqueous portion of the tear film. 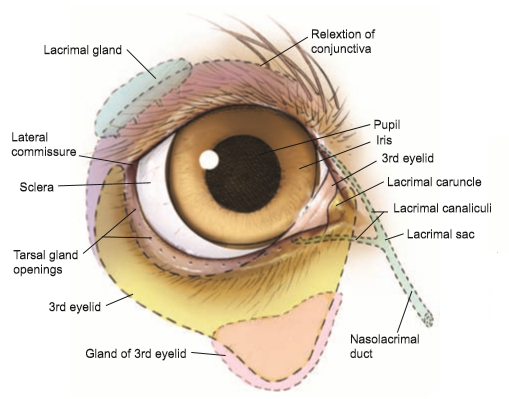 Moll glands and Zeis glands are located within the eyelid and contribute minimally to the tear film formation. The tear film is drawn into the nasolacrimal canaliculi via a negative intracanicular pressure created by contraction of levator palpebrae supeiors and orbicularis oculi muscles. 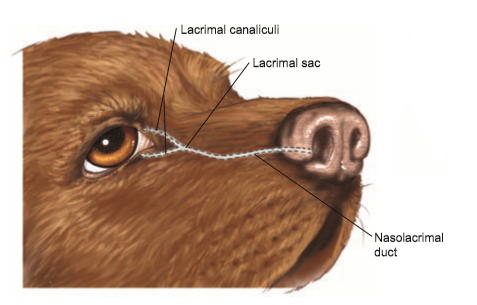 In dogs, the lacrimal sac is poorly developed and is simply a juction of the two canaliculi. McCracken T.O., Kainer R.A. and Carlson D. (2008) Color atlas of small animal anatomy: the essentials, 1st edn., Iowa: Lippincott Williams & Wilkins.